The aim of The Puppy Plan is to help puppies be fully prepared for their future as companion dogs, and to improve life for both them and their new owners. 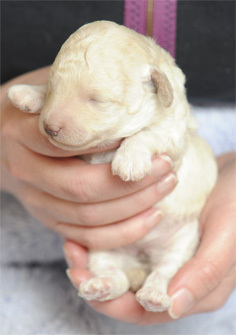 The foundations for a puppy’s future behaviour and character are laid down in the first 16 weeks of his or her life. This is a vital time when it is possible to develop the puppy’s brain, and shape the way he or she will turn out as an adult dog. This is also the time when most problem behaviours can be prevented, long before they even start, giving the dog a far more certain future – and the new owner far fewer potential problems. The plan has been developed to prevent behavioural problems, and cut the number of owners giving up on dogs and handing them over to rescue organisations, returning them to breeders, or having them euthanised for behavioural problems. Many, if not most behavioural problems can be prevented through good socialisation and early education – these can include aggression, noise phobias, separation anxieties, over-reactivity, learning problems and much more. The biggest cause of death in dogs under two is euthanasia due to behavioural problems. The plan for breeders or early care givers involves an eight week programme in which the puppies will be introduced to various sounds, sights, and the different types of textures and surfaces. The following 8 weeks for the new owners are focused on socialising and habituating the puppies to stimuli and experiences that are going to be relevant in his future. The object of this plan is to expose the puppy during the crucial stages of development in order to have the puppy socially prepared for its new environment. Whether you are a breeder, care giver, shelter canine carer or a new dog owner, rearing your puppy the best way starts here. In this site you will find a complete programme for socialising and habituating your pups for the crucial first 16 weeks of their lives. The Dogs Trust Malta team will be on hand to offer support and assistance to anybody actively involved in The Puppy Plan or needs further information on Dog Training Made Easy. Select your preferred Menu item to go to dedicated pages for BREEDERS, NEW OWNERS or to DOWNLOAD manuals, check-lists and a variety of sounds to use for your puppy plan.